Dallas Cowboys - NFL Brushed Basic Logo Blue Cap, by Reebok. 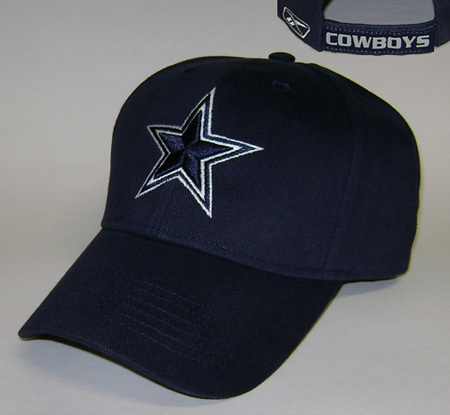 The Dallas Cowboys basic logo brushed adult cap features a structured style with raised embroidery. This officially licensed Dallas Cowboys NFL cap is constructed of 100% brushed cotton and has an adjustable velcro closure. 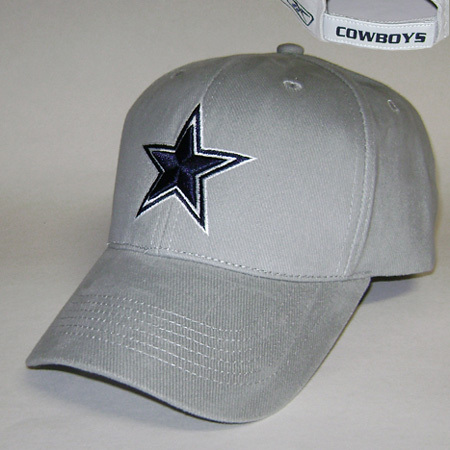 Dallas Cowboys - NFL Brushed Basic Logo Grey Cap, by Reebok. 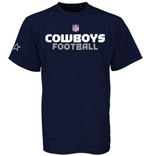 Dallas Cowboys - NFL Navy Orbital Tee, by Reebok. 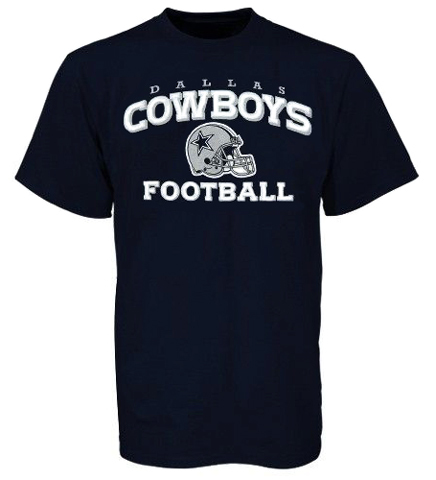 Officially licensed Dallas Cowboys navy NFL orbital t-shirt, 60% cotton and 40% polyester. 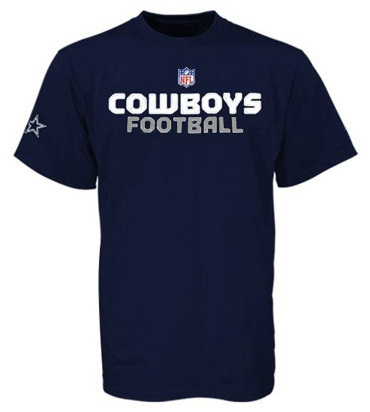 This tee features a NFL Shield logo and Cowboys Football screen printed on the front, Dallas Cowboys logo on the right sleeve and Reebok logo on the left. 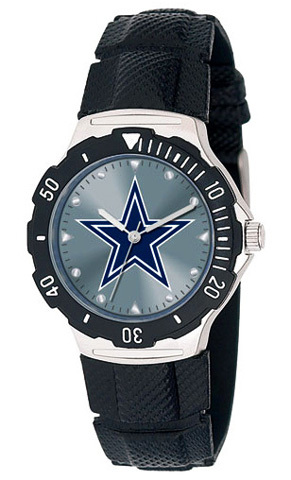 Authentic Dallas Cowboys NFL Apparel. 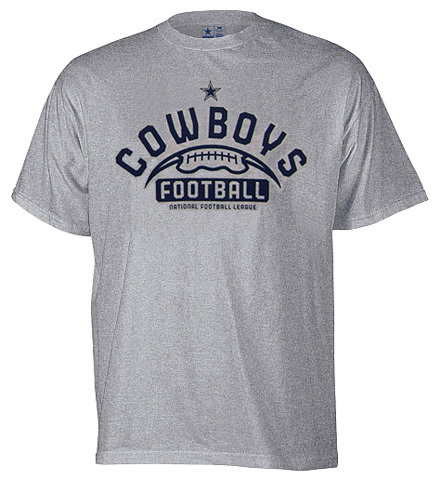 Dallas Cowboys - NFL Grey Practice Tee, by Reebok. 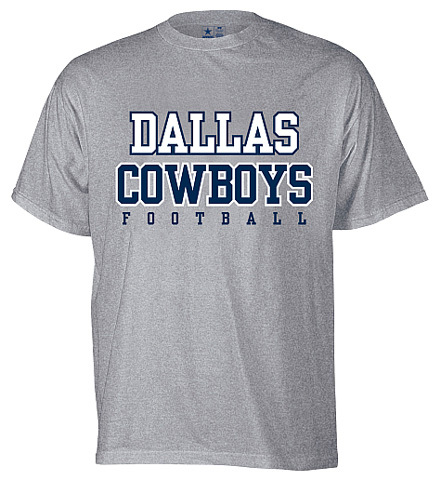 Officially licensed Dallas Cowboys gray NFL practice t-shirt, 90% cotton and 10% polyester. 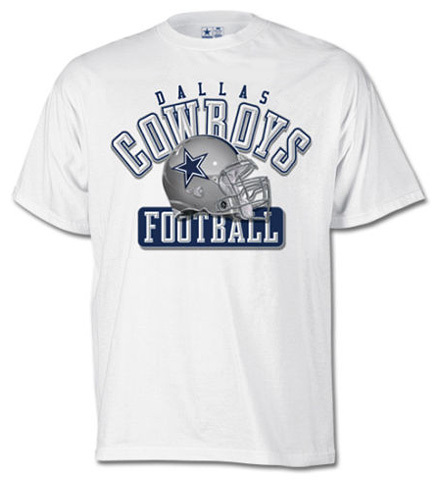 This tee features Dallas Cowboys Football screen printed on the front. Authentic Dallas Cowboys NFL Apparel. Dallas Cowboys - NFL Navy Long Sleeve Practice Tee, by Reebok. 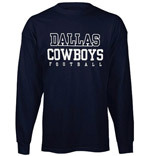 Officially licensed Dallas Cowboys navy long sleeve NFL practice t-shirt, 100% cotton. 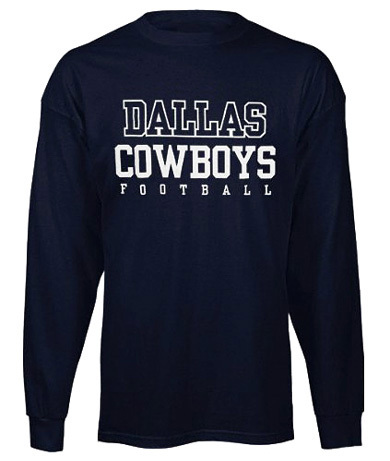 This long sleeve tee features Dallas Cowboys Football screen printed on the front. Authentic Dallas Cowboys NFL Apparel. Dallas Cowboys - NFL Grey Gym Issue Tee, by Reebok. 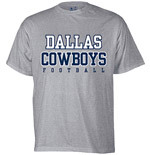 Officially licensed Dallas Cowboys gray NFL gym issue t-shirt, 90% cotton and 10% polyester. This tee features a Dallas Cowboys Football logo screen printed on the front. 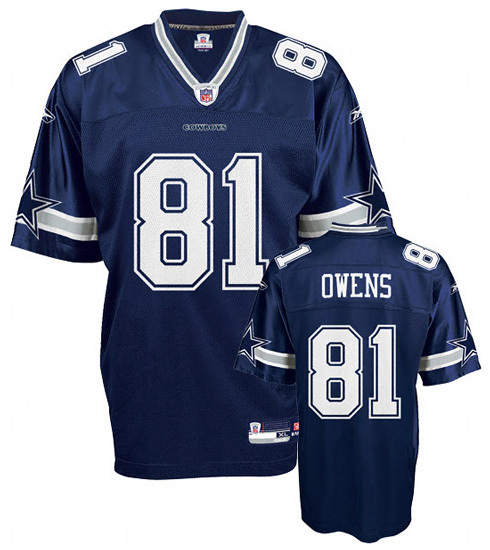 Authentic Dallas Cowboys NFL Apparel. 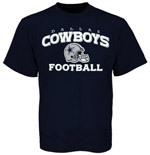 Dallas Cowboys - NFL Navy Stacked Helmet T-Shirt, by Reebok. Officially licensed Dallas Cowboys navy NFL stacked helmet t-shirt, 100% cotton. This tee features a Dallas Cowboys Football logo and helmet screen printed on the front. 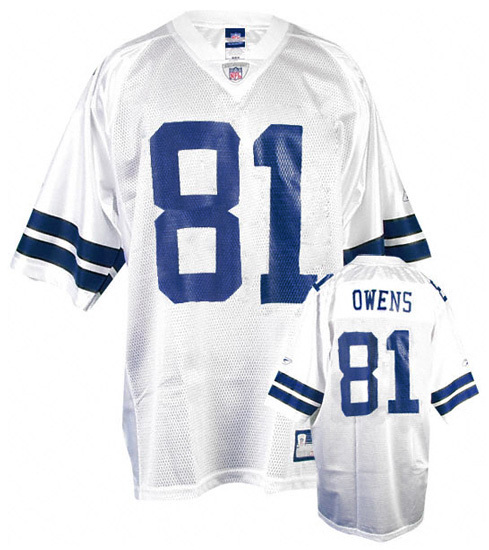 Authentic Dallas Cowboys NFL Apparel. * This tee runs larger than average. Dallas Cowboys - NFL Helmet Issued T-Shirt, by Reebok. Officially licensed Dallas Cowboys white NFL helmet issued t-shirt, 100% cotton. This tee features a Dallas Cowboys Football logo and helmet screen printed on the front. Authentic Dallas Cowboys NFL Apparel.